One of the greatest jazz trumpeters of all time, Fats Navarro had a tragically brief career yet his influence is still being felt. His fat sound combined aspects of Howard McGhee, Roy Eldridge, and Dizzy Gillespie, became the main inspiration for Clifford Brown, and through Brownie greatly affected the tones and styles of Lee Morgan, Freddie Hubbard, and Woody Shaw. Many valuable performances from the height of the bop era are included on this double CD. 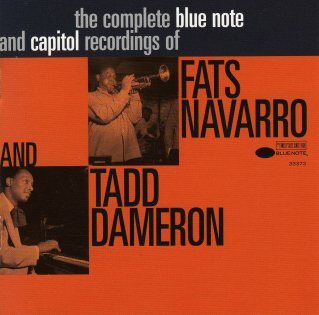 Subtitled "The Complete Blue Note and Capitol Recordings" and comprised of 23 songs and 13 alternate takes, the reissue features the great trumpeter Fats Navarro in peak form with three groups headed by pianist/arranger Tadd Dameron, in trumpet battles with one of his major influences, Howard McGhee, and on a remarkable all-star quintet with pianist Bud Powell and the young tenor Sonny Rollins; among the other sidemen are altoist Ernie Henry; tenors Charlie Rouse, Allen Eager, Wardell Gray, and Dexter Gordon; and vibraphonist Milt Jackson. In addition to such gems as "Our Delight," "Lady Bird," "Double Talk," "Bouncing With Bud," "Dance of the Infidels," and "52nd Street Theme," Fats is heard with the 1948 Benny Goodman septet ("Stealin' Apples") and Dameron leads a group with the 22-year-old Miles Davis. On a whole, this double CD has more than its share of essential music that belongs in all historical jazz collections. thanks for this - sounds great. why don't you post some more quality? you have a fantastic blog, shame to let it go silent.